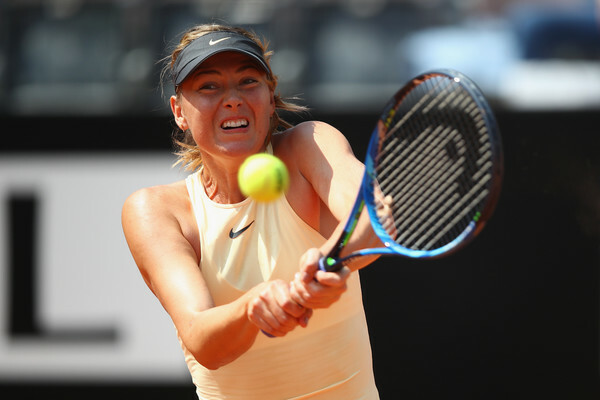 Maria Sharapova overcame a slow start as she overcame a firing Jelena Ostapenko in the quarterfinals of the Internazionali BNL D'Italia, triumphing with a stunning 6-7, 6-4, 7-5 scoreline. In what was just the second top-10 win of her comeback, and first of 2018, Maria Sharapova impressively claimed a stunning 6-7, 6-4, 7-5 marathon victory over the world number five Jelena Ostapenko. Coincidentally, both of her top-10 wins came against players ranked in the top-five. Both players entered this match-up in great form, with Ostapenko defeating quality players like Zhang Shuai and Johanna Konta in succession. Whereas, Sharapova was dragged to the distance on two occasions, but rallied to oust Dominika Cibulkova, Daria Gavrilova, and Ashleigh Barty. A highly-anticipated encounter in the quarterfinals of the Internazionali BNL D’Italia, the clash of the reigning and former Roland Garros champions finally occurred today, especially when it should have happened in Cincinnati last year but Sharapova had to withdraw, while they were on course to meet in the second round of Madrid last week, but Irina-Camelia Begu foiled the plans ultimately. This time, in their first-ever meeting, Sharapova overcome a slow start to spring a surprising comeback victory, triumphing after three-hours, 10-minutes of play over the Latvian. The world number five had the perfect start to the match, storming to a commanding 5-2 lead before being pegged back and had to save a set point to take the opening set. 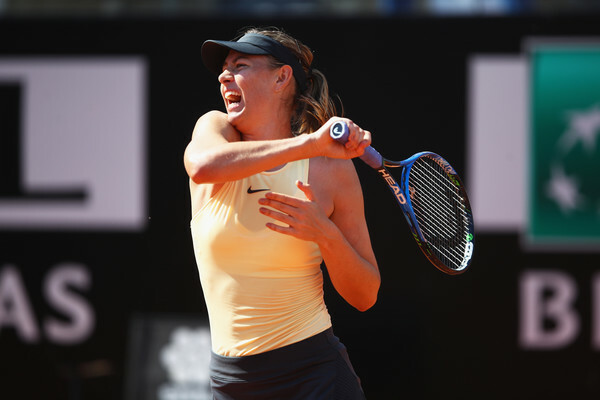 However, Sharapova fought back from a break and a set down, sending the match into a decider where she suffered a slight wobble while closing out the match before sealing the win on her third match point. It was an anti-climatic start to the match after all the hype which the encounter received — and the proceedings were relatively surprising as the match was completely in Ostapenko’s hands. Sharapova made the right decision to start the day receiving, as she earned a break point chance but was unable to convert. Ostapenko’s inconsistency showed up, having thrown in three double-faults in the marathon nine-minute game before rallying to grab the nervy service hold. Sharapova will rue her missed opportunity as she was totally outplayed on her serve. Ostapenko went for her shots and attempted to dictate play throughout the rallies, and she successfully did so. Sharapova looked lost on the court, losing 10 of the last 11 points as the world number five powered to a commanding 3-0 lead. Ostapenko was simply firing on all cylinders and Sharapova had no answers — she faced multiple break points to go down a double-break, but the Latvian showed her first signs of nerves as she failed to convert her chances which allowed the Russian to get on board. Nonetheless, the world number five was untouchable on serve, eventually jumping out to a huge 5-2 lead. There, Sharapova dug deep and capitalized on her opponent’s errors for a confidence-boosting hold, saving two set points and forced Ostapenko to serve out the set. 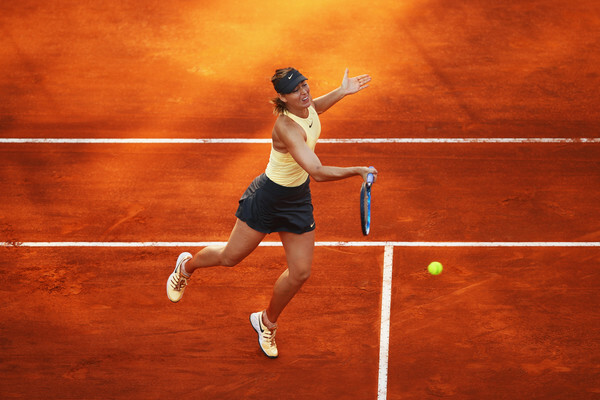 What happened next certainly came out of nowhere — the five-time Grand Slam champion upped her level and stepped up her returns, firing winners and broke back to love, returning on serve. The opening 45 minutes of play was absolutely one-sided and there does not seem to be a contest, but Sharapova’s experience with nerves brought her straight back into contention. Four set points came and gone for Ostapenko as her fearless aggression often backfired, especially when Sharapova once again escaped from the brink by saving yet another two set points while serving to stay in the set at 4-5. Inability to find her first serves then saw the Latvian getting into trouble for the first time in the match, as Sharapova blasted some return winners and Ostapenko throwing in an unexpected double-fault on break point, gifting Sharapova the lead for the first time as well, alongside the chance to serve out the set. Sharapova soon returned the favour, though, as she sent in her sixth double-fault of the set and sent the set into a tiebreak. The scores were kept tight but it was the Russian who earned her first set point of the day. Fortunately, the determined Ostapenko finally found her first serve at such a crucial time, impressively fending off the tough resistance and ultimately took the opening set 7-6 after a marathon 80 minutes. In a set where Ostapenko earned her first set point after 43 minutes, she closed it out 37 minutes later. Many would have thought that Sharapova will fade away especially after the marathon opening set which she lost — and also considering that she had played two three-setters in the week without having any rest days. She had game point opportunities in the opening game, but Ostapenko fended them off with stunning winners which caught the Russian off-guard. This allowed the defending Roland Garros champion to grab the break, opening a lead of a set and a break. That moment seemed to point towards the victory sign for Ostapenko since Sharapova’s fitness level has been a worrying point since her comeback. Nonetheless, as of how things turned out eventually, the Russian’s body is still able to handle such thrilling marathons, having played three matches which went the distance this week. In what could be the most important break for Sharapova in the set, it was an immediate break back from the mental giant as the Russian started to viciously go for the second serves. After a series of service holds, it was surprisingly Sharapova who made the next breakthrough as the momentum was running in her. 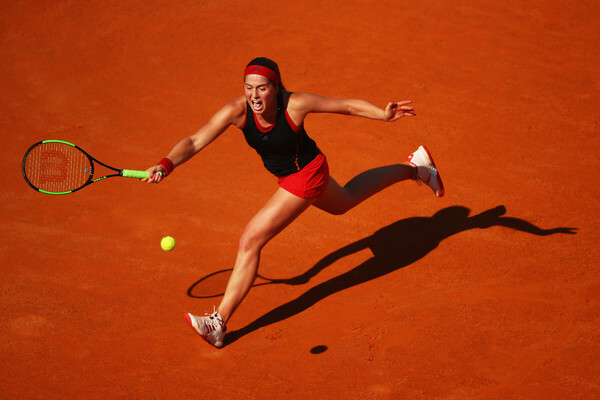 Aggressive play from the world number 40 helped her earn a 4-2 lead, which was short-lived as Ostapenko rebounded in the most impressive fashion, rattling off consecutive games to level the scores. The Latvian was anticipating the Sharapova serves better than ever, as the Russian’s serving placement was too predictable which allowed the world number five to exploit those vulnerable second serves. Looking to clean the lines with her solid groundstrokes, Ostapenko had the chance to close out the win after earning a break point in the ninth game. Unbelievably, Sharapova held her nerves and came up with a fearless forehand winner which just landed on the line, narrowly holding serve for 5-4 ultimately. Serving to stay in the set at 4-5 down, Ostapenko felt the nerves weighing on her shoulders and Sharapova’s backhands started to label themselves as huge weapons. The Latvian started to send in tricky serves and attempted to stun Sharapova with a surprising first serve with no pace on the Russian’s set point, though it backfired in the worst possible way, with the former world number one crushing a backhand return winner to take the second set 6-4. A rare phenomenon occurred at the start of the deciding set as both players rallied together for five consecutive service holds, the first time this happened since the opening 40 minutes of the match. Both players were dominating on their serves and Sharapova had a visible improvement in her first serve percentage while Ostapenko defended her second serves much better. Unexpectedly, Sharapova drew first blood in the sixth game. Just when Ostapenko seemed on course for yet another comfortable hold at 40-15, Sharapova’s backhands proved their worth, helping her to grab the first break as she eventually powered herself to a commanding 5-2 lead within a blink of an eye. 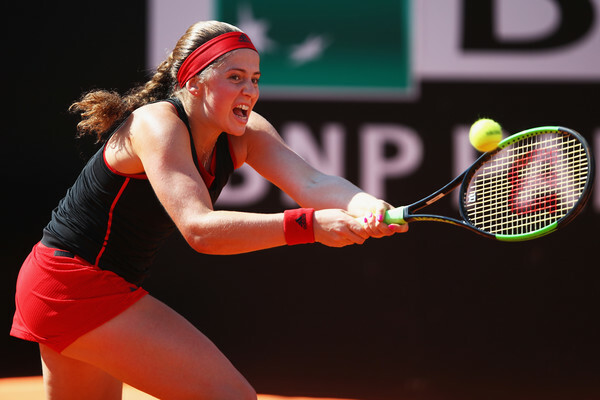 Ostapenko called for her coach in a desperate attempt to produce a comeback, and she was able to keep her focus as she started to fire on all cylinders. Closing in on the finishing line, Sharapova stumbled at the critical moments, with her first serves going AWOL while serving for the match. A costly double-fault at 30-30 gifted Ostapenko her first break point of the set, which she dutifully converted as she started to rise in confidence. Serving to stay in the match at 4-5 down, she found herself in deep trouble once more having wasted multiple game points. Sharapova found life in her return game, sending down a formidable forehand return winner to earn one of her match points. However, she wasted both match points, making errors on the second-serve returns as pressure bounded her hands. As a result, Ostapenko was given a second chance to clinch the confidence-boosting game, and she fired a stunning backhand down-the-line winner to level the scores at 5-5 with the scores ticking to the three-hour mark exactly. Sharapova seemed exhausted but it was the adrenaline which got her through a tricky 11th game, escaping from deuce to regain the lead and forcing Ostapenko to serve to stay in the match again. The Russian started to dictate play with her forehands once more, moving Ostapenko all around the court as the five-time Grand Slam champion earned match points once more. This time she was able to close the match out, grabbing the marathon win with a stunning backhand winner after 190 minutes of play.